If you have not been able to get tickets for Bill’s Qualmpeddler shows in Melbourne at Hamer Hall in September, we are delighted to announce an extra show at the same venue on Wednesday 12th September 2012. Bill was recipient of the 2012 Spirit of Hammer award. He attended the ceremony to collect it and also presented Mastadon with their Best Album award. Here’s Bill with his thing of precious beauty. If you have had trouble getting tickets for Bill’s September 2012 Qualmpeddler shows in Brisbane, Australia don’t fret as a further date has just been added. The additional Qualmpeddler show will take place on Monday 24th September 2012 at the QPAC Concert Hall in Brisbane. Tickets are on sale NOW and you can find further information and buy your tickets on the LIVE page. An extra date has now been added to Bill’s 2012 Qualmpeddler Tour of Australia. It is Thursday 30th August 2012 at Thebarton Theatre in Adelaide. For full details of Bill’s 2012 Qualmpeddler Tour of Australia and New Zealand click HERE. Tuesday 19th June 2012 – We are pleased to let you know that the technical issue we were experiencing with our web shop payment processing has now been resolved and the shop’s online checkout system is now fully operational again. Please accept our apologies for any inconvenience this may have caused you. Two additional dates in New Zealand have been added to Bill’s forthcoming Qualmpeddler Tour 2012. Please visit the TOUR PAGE to purchase tickets for these events. Bill Bailey was the closing act at this year’s Hay Festival. Read The Telegraph’s review of his performance HERE. 2012 Australia and New Zealand Dates On Sale Now! Hello people of Australia and New Zealand. I am delighted to announce that I’ll be re-visiting your shores this year, and really chuffed about the new show and about the new poster, which is a pastiche of a Mao era Chinese propaganda campaign. I spent a month in China earlier this year, which was a extraordinary experience and has been quite an inspiration for themes in this tour, Qualmpeddler. 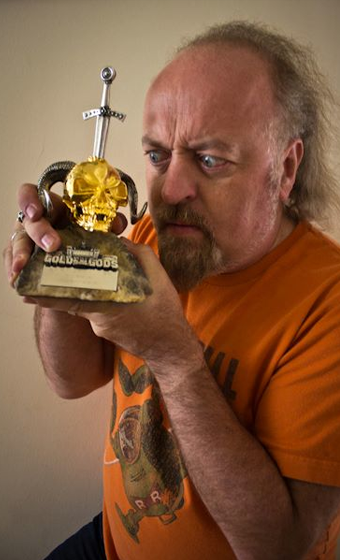 Tickets for Bill Bailey’s Australia and New Zealand Tour 2012 are ON SALE NOW! Quick! Don’t miss your chance to catch Bill Bailey performing Dandelion Mind (Gently Modified) live on stage at The Olympia Theatre in Dublin on Friday June 1st and Saturday June 2nd 2012.